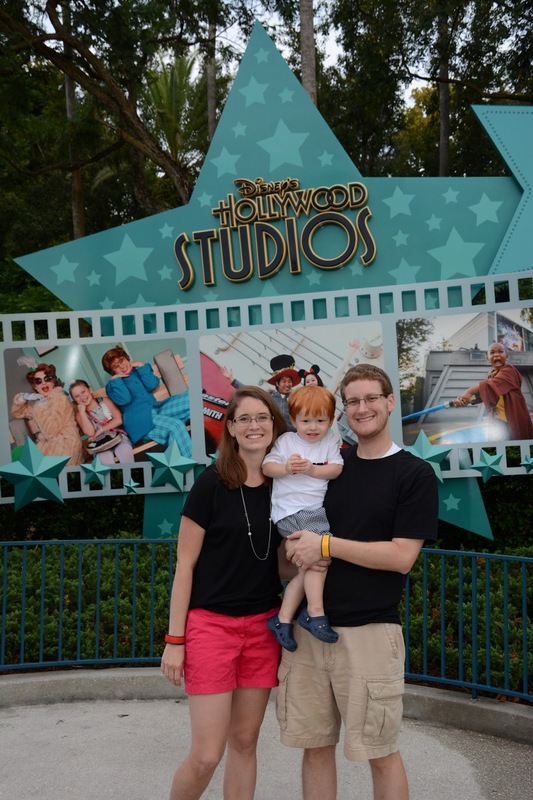 Day 6 of our Disney World trip was spent at HollywoodStudios, all day. That's right. 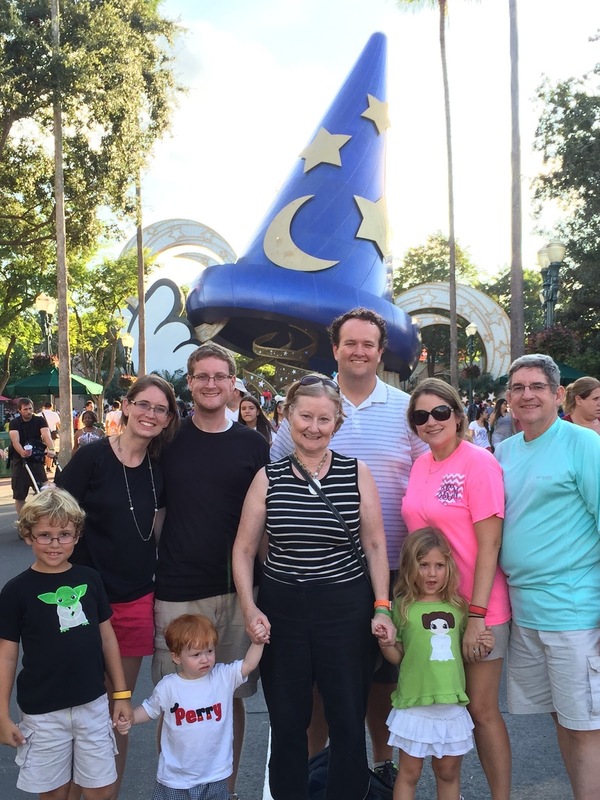 Even with a 21 month old we were in the park from rope drop until after Fantasmic! It was a long day but we made it and had fun all day long. 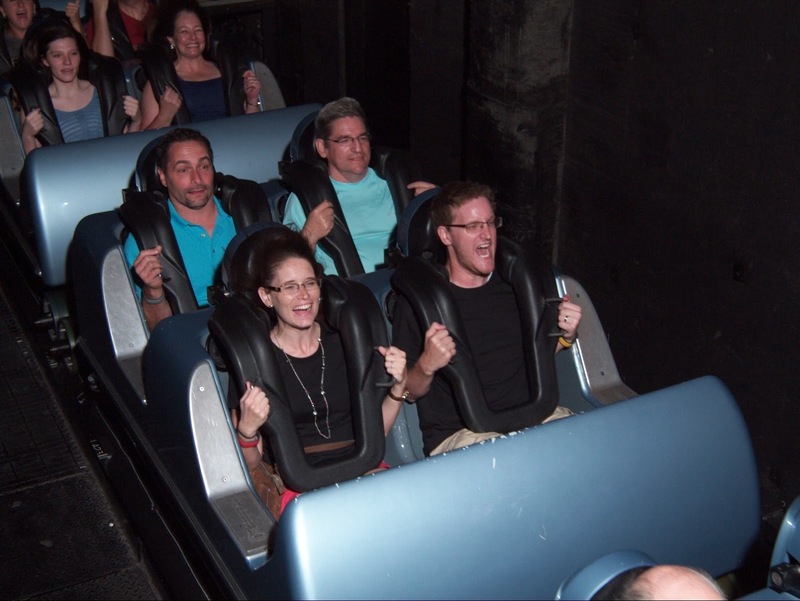 First thing on the docket was a ride on Rockin Roller Coaster. Emily took the kids to go sign up for Jedi training while the rest of us speed walked to the coaster. Ann watched Perry while Gary, Matt, Andrew and I rode. We had an awesome time. It was a great way to start our morning. While we were waiting on everyone to rendezvous, Andrew and I grabbed a rider swap for Rockin Roller Coaster (we didn't know Ann wasn't riding at the time) and we also walked over and grabbed a rider swap for Tower of Terror to use later in the day (since we knew we could get someone to watch P while we rode together it was like an extra fastpass for us). Probably a bit of a disney ethical grey zone, but it worked. Hands down the worst 15 minutes of the day proceeded next. Perry's arch nemesis during periods of the trip was the stroller...when he just wanted to run around. 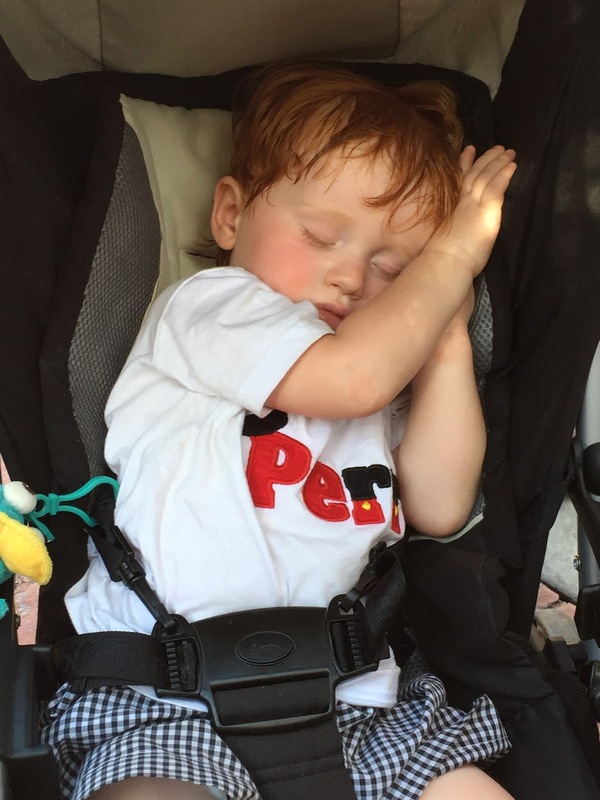 We tried desperately to get him to stay in the stroller while we headed to a playground on the other side of the park, but he just wouldn't have any of it. 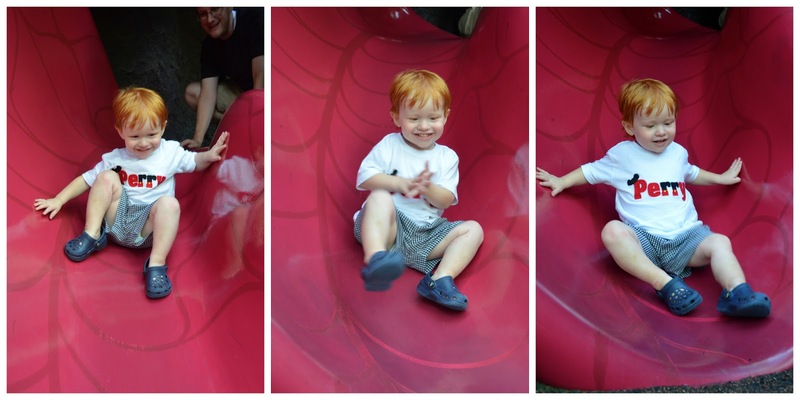 By the time we made it to the Honey I Shrunk the Kids playground he was in full on meltdown. We gave him snacks and coaxed him to play and slide and got him in a better mood. But it was rough. Thankfully that was the worst meltdown of the whole trip...and was short lived. Then it was time for our Toy Story Mania fastpass as a whole family. Emily had successfully gotten the kids enrolled to fight Darth Vader later on that day. We love Toy Story Mania. It's so fun. Perry rode with Granna and Grandaddy. 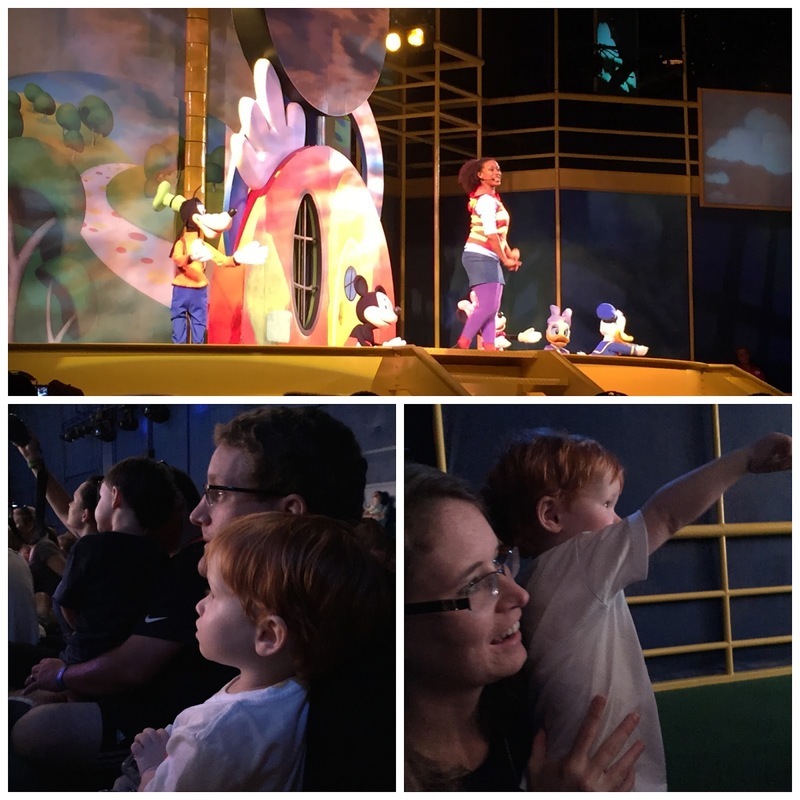 From there our little family went to see the Disney Junior stage show. Perry loved it. It had all of his favorite characters and songs. We had a little time to kill after Disney Junior so we went to the Animation Courtyard to see what kind of characters were there with little wait. 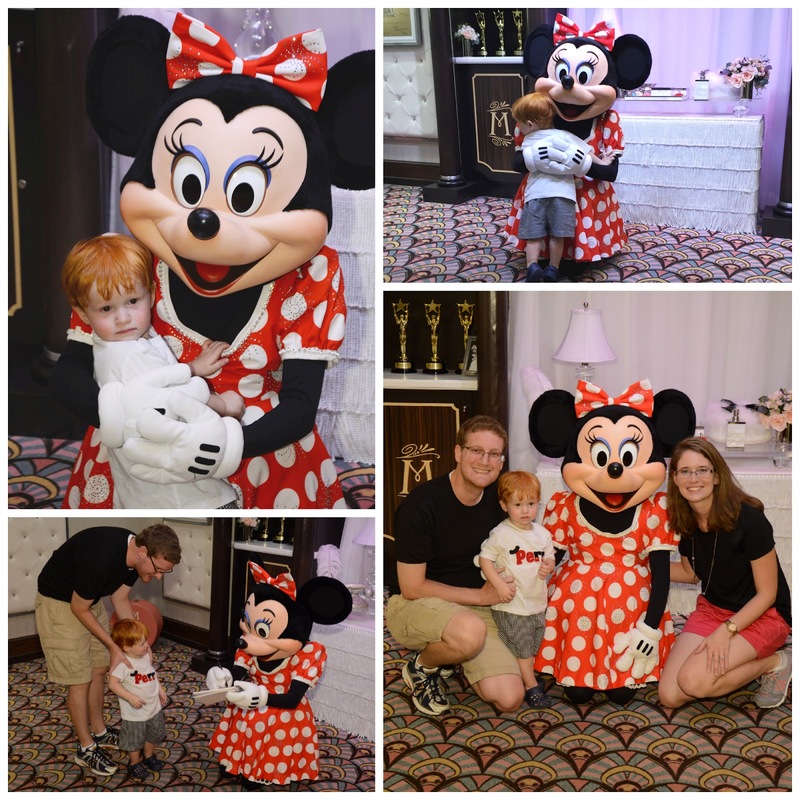 There was almost no wait to meet Minnie, so we took advantage of that. We had an awesome lunch planned at Hollywood and Vine with the whole family. 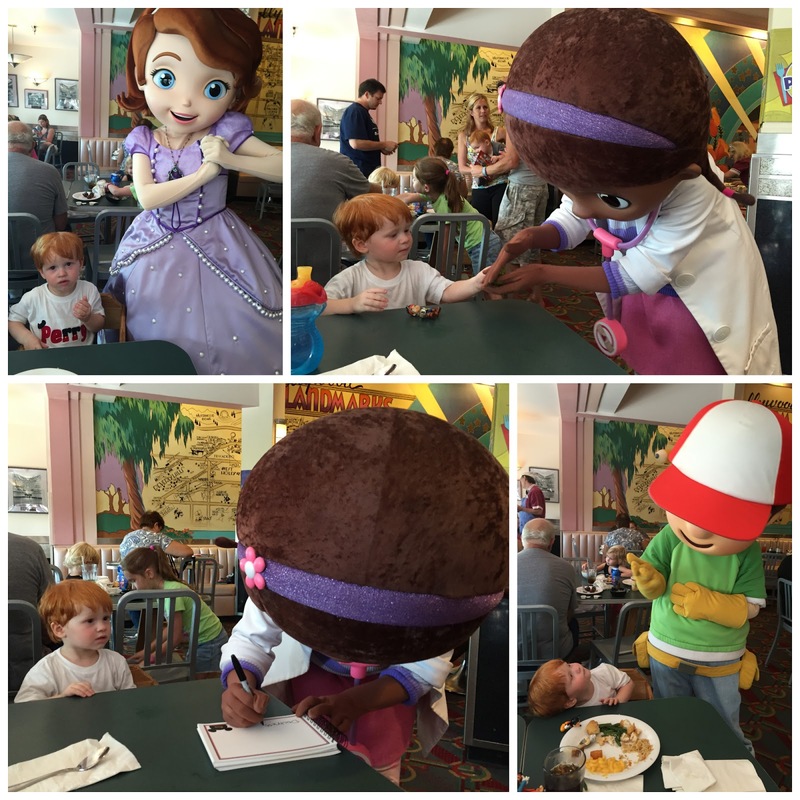 We knew we wanted to do it because you get to dine with Disney Junior characters like Sofia, Doc McStuffins and Jake. Perry's favorite part of the meal? The tater tots. 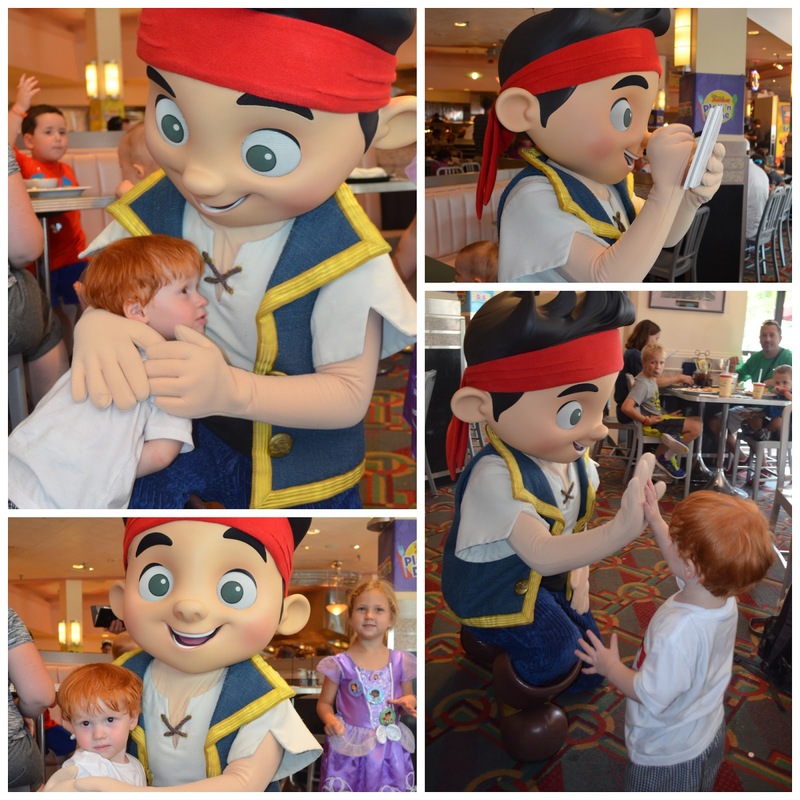 And spotting Jake (his favorite character) across the restaurant. He was the last character to come visit us and Perry was just tolerant of the others, but when he saw Jake, Perry got so excited. 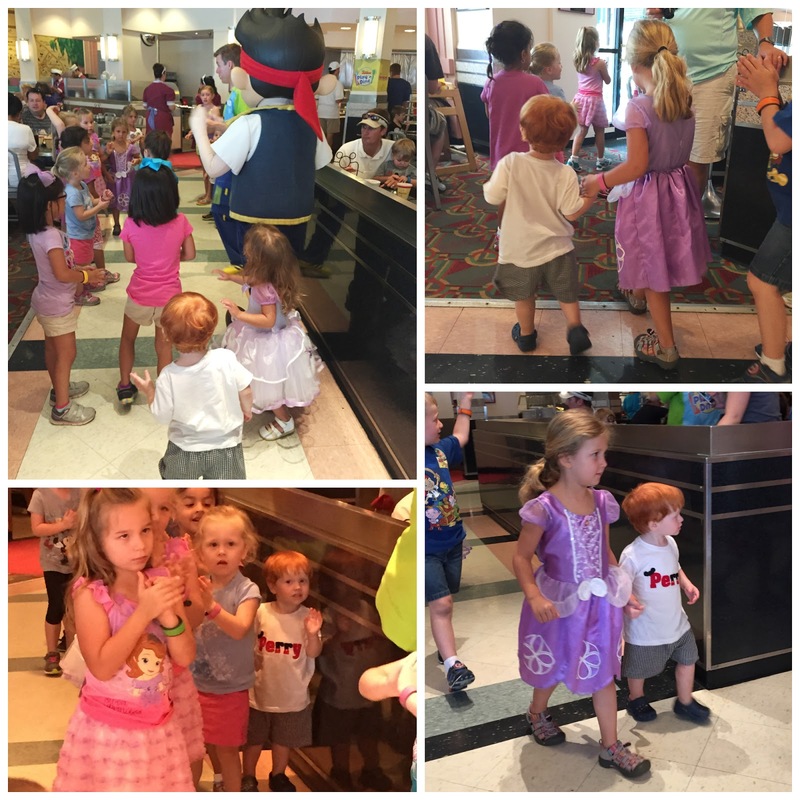 Every 15 minutes or so they invited kids to come and dance around the restaurant with the characters. 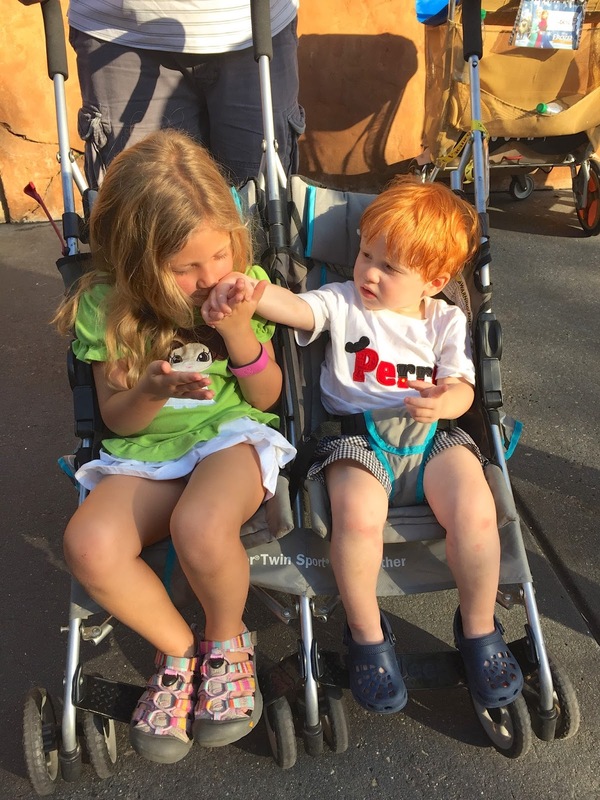 Perry had fun parading around with Jake and cousin Kate. I knew Perry was tired and tired of being out in the hot sun so after lunch he and I ducked into the Baby Care Center for some air conditioned respite while the rest went and watched the Indiana Jones show. 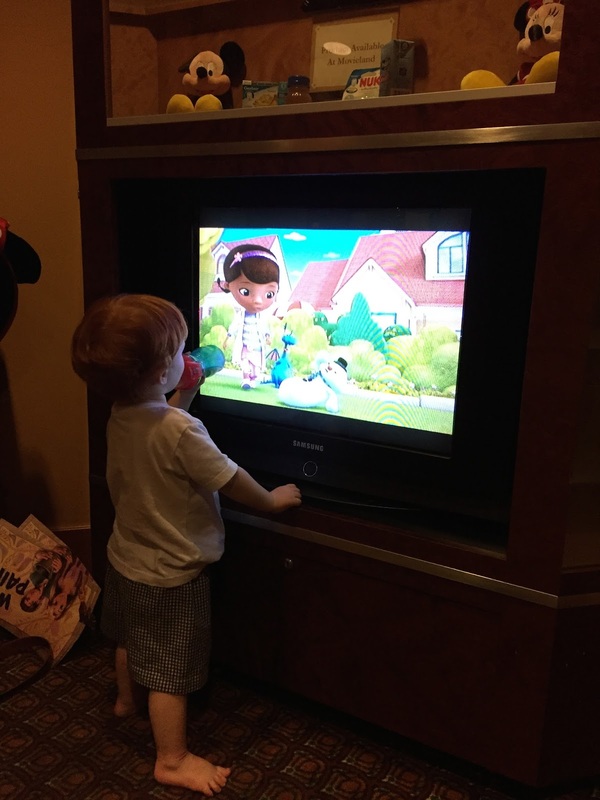 Perry wasn't interested in falling asleep, but enjoyed some chill time watching Disney Junior on the TV. After the others got done with Indiana Jones we met back up outside the Tower of Terror. Perry wound up falling asleep on the stroll there so we found a shady spot and let him just sleep in the stroller a while. 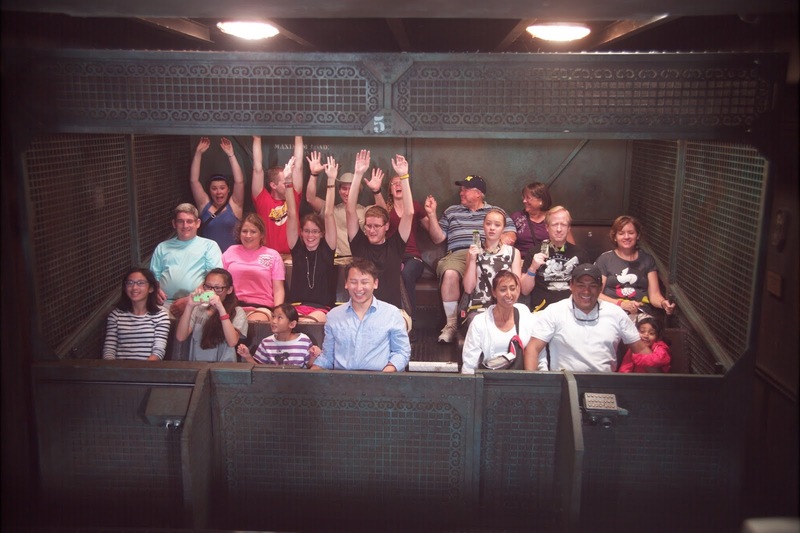 A few of us rode Tower of Terror and we all waited to see if the early Characterpalooza would happen. It didn't. 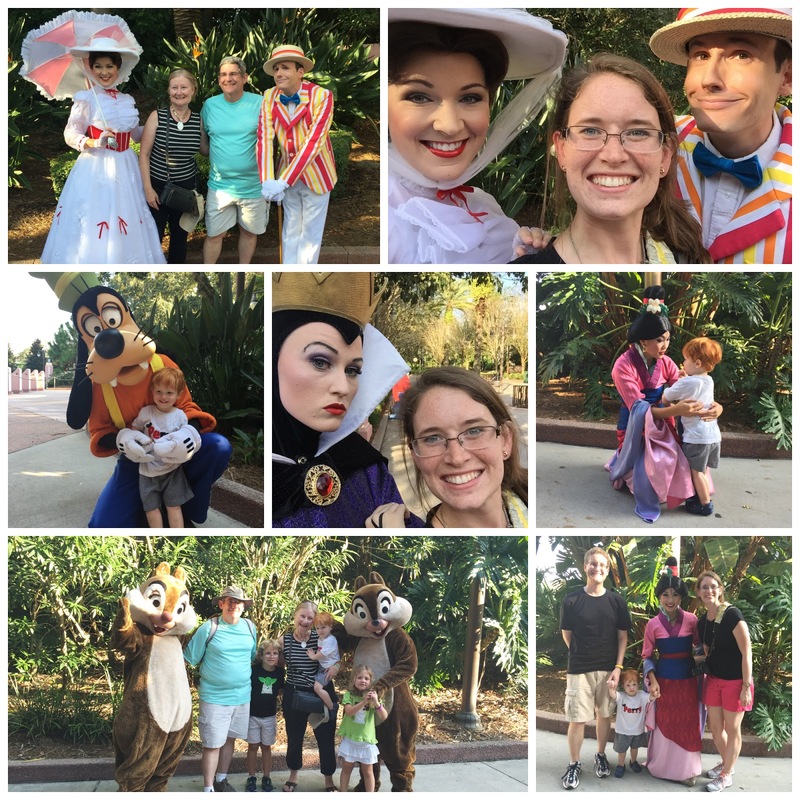 From our reading it sounds like the early time may or may not happen...but the later time almost always happens on days when there is a Fantasmic! show. So we decided to go watch Beauty and the Beast and come back at 5 for Characterpalooza. Kate had a magical moment when she was selected to be given a rose by the beast at the end of the show. She was so excited. And we all got great seats for the show thanks to her cute self. Perry was totally zonkered so Andrew stayed out and took Perry somewhere air conditioned to nap. Here is Kate getting picked to get the rose. 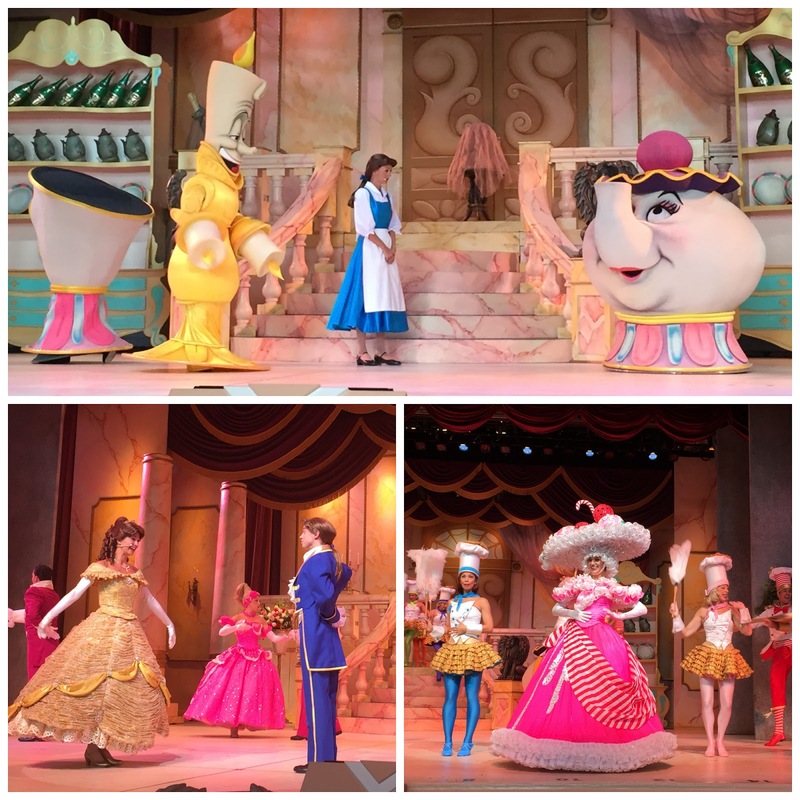 After Perry woke up and Beauty and the Beast wrapped, we all met back up to experience another day of Characterpalooza. Its this crazy 15 minutes where they open the gates near the Tower of Terror exit and you can go back and meet a bunch of random characters with little or no wait. We had all used up our fastpasses for the day so we stopped by the kiosk to see if there were any left for fantasmic that night. We were worried about getting into fantasmic since we would be coming straight from watching the Jedi Training Academy so we were super happy to snag fastpasses for it. 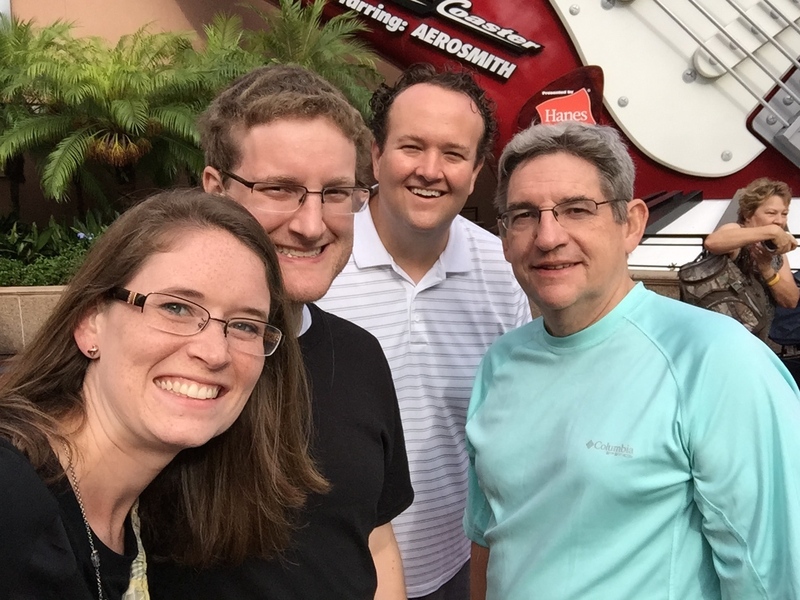 Then we all went and rode the Great Movie Ride and had a quick, simple dinner at the Commissary. 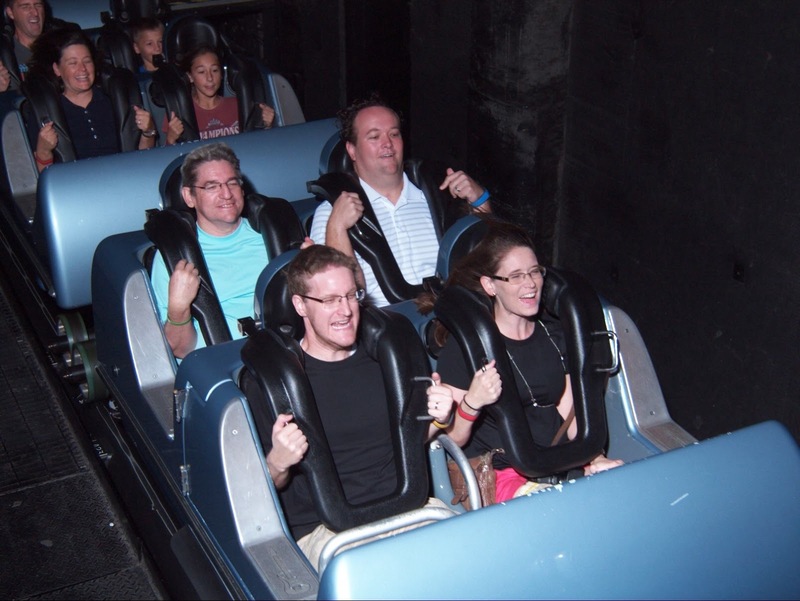 We had that ride swap pass for Rockin Roller Coaster from the morning so Gary, Andrew and I ran and got one more thrill ride in for the day. 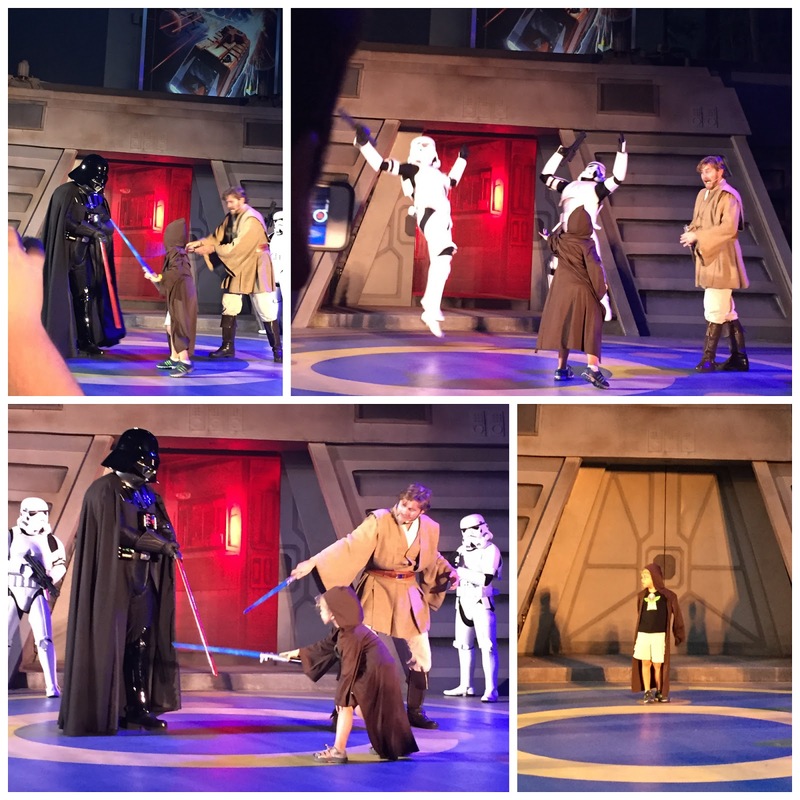 Then it was time to see Ben and Kate in the Jedi Training Academy. They did so good. The day ended with Fantasmic. It has been ages since I have seen the late night Hollywood Studios show. It was great and we wound up haphazardly with really awesome seats right in the middle. Perry loved it and didn't mind the noise and fire and scary-ness one bit. And that wraps up one amazing day in Hollywood Studios.